The VWR Incubator 1500E offers compact and consistent heating, in a simple to operate benchtop friendly foot print. 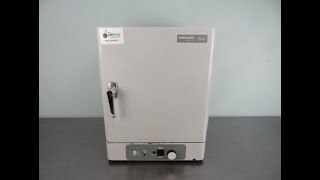 This laboratory incubator has a 28 liter (1 Cu Ft) capacity, and thanks to 2” thick fiberglass insulation, gravity convection and a tightly sealed, gasketed door has a great uniformity of ±0.5°C at 37°C. Heating this benchtop incubator is powered by low watt density strip heaters that are economical to operate and provide a temperature range of between 5°C above ambient to 70°C. The interior of this sturdily constructed incubator is corrosion resistant, easy to clean stainless steel, with stainless shelving that requires no tools to remove or adjust. This VWR Incubator 1500E has been fully inspected and is ready to ship. All of our lab equipment comes backed with our standard warranty. Should you have any questions about this or any of our other incubators, please don't hesitate to contact us.